‘Tis the Season to be..Jolly? The holiday season is here once again, and don’t get me wrong, I love the holidays… well at least I use to. It’s a magical time that brings family and friends together, full of gorgeous lights and decorations, the feeling of warmth and hearts feeling full of love. A time when kids are so excited and pure joy just explodes from their incredible smiles. A time to be thankful, a time to love and for us a time to grieve. A reminder that we have one less christmas list to shop for, one less table setting to set, one less santa letter to mail. One less smile in our family photos and one less child to make memories with. A reminder of how it could be, or how it would be and really how it should be. It’s a time where we shut down, become harder to read and may say “no” a lot more often. A time that we just can’t get ourselves ready or excited about seeing other families that aren’t missing a piece of them. A time that jealousy of a “normal” life takes over. A time when the tree goes up in 5 minutes with no christmas music playing in the background and no child running around and putting his favourite ornaments in the perfect spots on the tree. It’s a rough time that forces us to act “happy” around others when it’s just not in our hearts. Now, don’t think we won’t make christmas special for Miller, of course we are so excited for him to have his first Christmas. We will still have milk drank, cookies eaten by santa and a few nibbles of carrot from the reindeers. There will be presents under the tree in brightly wrapped paper and lots of love and thought put into each of the gifts. There will be wrapping paper and boxes that the dogs will try and eat on the floor and of course there will be smiles and hugs all around. At the same time, there will always be a missing piece to our puzzle, a beat that no longer pumps in our hearts and some excitement that will forever be lost. With this new life we now live we will have a few new traditions that may be a little different than others but will hold so much meaning to us. Our traditions will involve being a little more selfish and staying home curled up near the fireplace and watching Christmas home movies from before. Visiting Masons gravesite to read him Christmas stories and decorating his forever sleep spot. Looking through flyers and wondering what toys he would pick this year and what his special pjs and movie would be before santa came to visit. ( For his last christmas he chose the movie Curious George a Very monkey Christmas) and now that movie will play on our TV every Christmas Eve. This season also brings guilt, yes guilt for enjoying times, smiling and laughing. I know Mason wouldn’t want that, but as parents you cannot help but feel it. The guilt of being excited for Christmas, the guilt of building that gingerbread house that he would decorate so carefully and perfectly, the guilt of not buying him presents and the guilt of not spending every second with him. The guilt of doing the same things without him as we did with him as if nothing has changed. As grateful as we are for all the love that is shown to us during the holidays, there is only one we wish for. Enjoy your holidays, spread as much love as you can, remember every minute of every day and most of all remember that excitement, those smiles and how full your hearts feel. We put up our tree today and Mason’s angel ornament is there. As I placed it on the branch I said a quiet prayer for your family. It’s inspiring that you are able to help others even though your hearts have been torn by grief. Mason will not be forgotten. I cannot even begin to imagine how Christmas would be – or any holiday/ celebratory event/ weekend/ weekday/ what-have-you – having had my child taken from my family. There are no words combine into the a comment that will make anything better here. I just hope you know how much you are loved and supported, in spite of that love and support coming from a place of blissful ignorance, because we are lucky to not have to know at the end of the day. I do know, at least, what an awesome family you are, and what an amazing friend and mother you are. I do have the good fortune to have made memories with Mason, and to recall them fondly amidst the great sadness that ties into his legend. 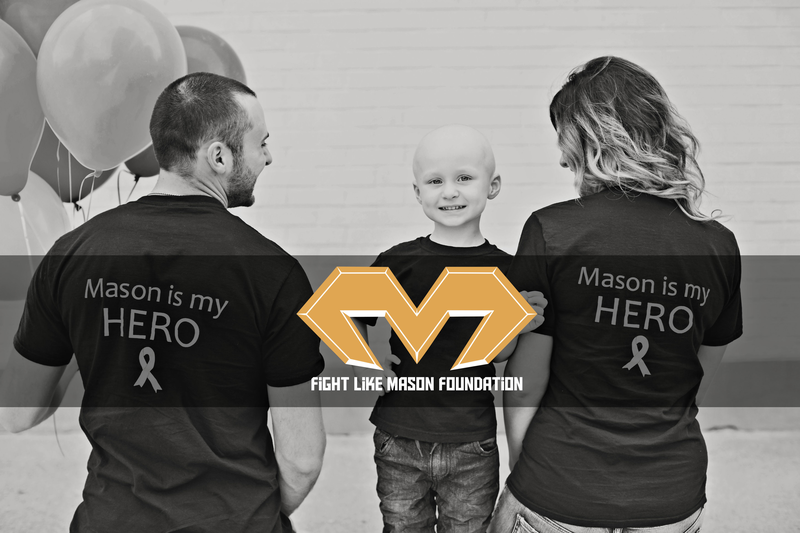 I do know that Miller is beyond lucky to have had such a sweet and optimistic older brother, someone he will undoubtedly, as he grows, look up to for his incredible strength, because his parents have successfully brought him to life through the Fight Like Mason Foundation. I do know that there are no better two people to have as parents in this lifetime. There is not a day that goes by that I do not think about Mason Bacon-Macri. He has deepened my heart; I have an entire set of feelings because I knew him, and a better understanding of what it means to actually love others. Love you guys – I am always here.